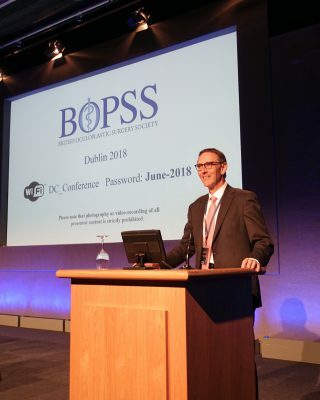 Mr Leatherbarrow gave a presentation at the annual congress of BOPSS in Dublin about his experience of facial fat grafting over the course of the last 20 years, and his more recent experience since 2012 with micro fat grafting and nanofat injections of the area around the eyes. 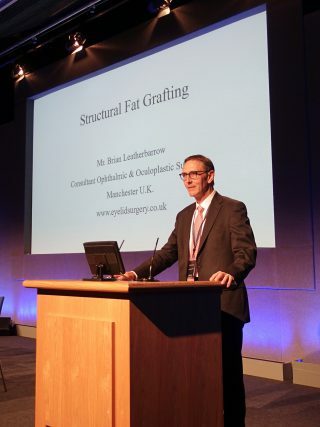 Mr Leatherbarrow spoke about the use of fat grafting in patients seeking facial rejuvenation, alone or to supplement the effects of cosmetic eyelid surgery (particularly in those patients who prefer to avoid dermal filler injections), and in patients with facial scarring and hollows following trauma. Microfat injections have become popular for the management of lower lid dark circles and tear trough defects.